Fill a pot ¾ full with water. Add bay leaf, juice from half of a lemon, the squeezed lemon half, ½ onion, and salt. Bring pot of water to a boil and reduce heat to simmer. Cover and simmer for 20 minutes. Return pot of water to a boil and then add unpeeled shrimp to pot and cook for 1-2 minutes. Remove shrimp from pot and place in an ice water bath for 10 min. Drain water and peel shrimp and devein, but leave tails intact. Cover and chill. In a large bowl mix all ingredients for cocktail broth. Add shrimp to cocktail mixture and let sit in fridge covered for 15 min. Serve in bowls or cocktail glasses. 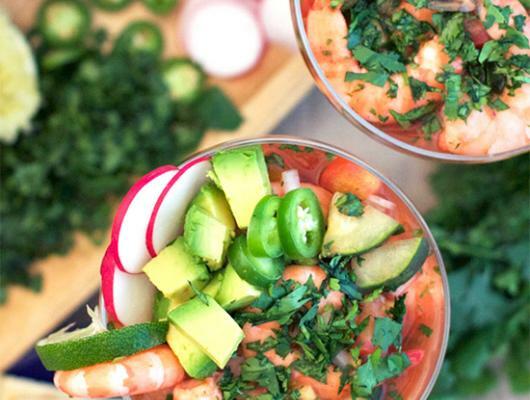 Add avocado, radish slices, and cilantro on top. Add more lime juice or hot sauce to your liking. Enjoy with either saltine crackers or tortilla chips (I prefer tortilla chips). 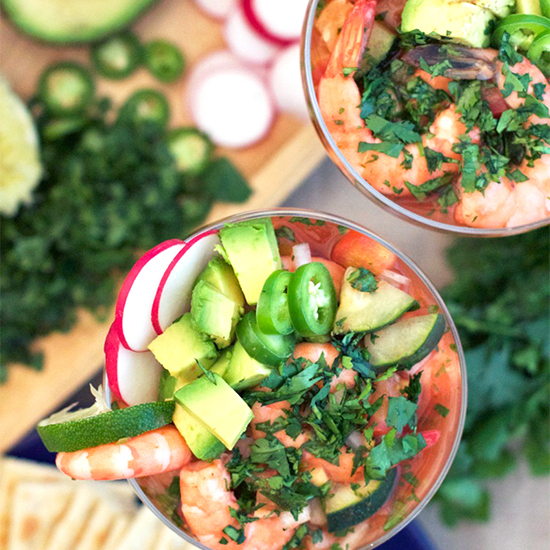 This Mexican Shrimp Cocktail is a perfect summer (or winter) treat packed with juicy shrimps, avocado, and an undeniably tasty broth. It’s a versatile treat that can be served up as an appetizer or a main entrée. It might just even make the perfect Super Bowl treat! And the MVP trophy goes to….